When looking at the battle of the Crater, it is a study in contrasts. The digging of the tunnel and the explosion of the mine at dawn on July 30, 1864, go here to read about the tunnel construction, was a tribute to the ingenuity and sheer compentence of Lieutenant Colonel Henry Pleasants and his men of the 48th Pennsylvania, who, with almost no help from the rest of the army, gave the Army of the Potomac a golden opportunity to take Petersburg and bring the War to a rapid conclusion. That this opportunity was missed was largely attributable to criminal incompetence on the part of the generals involved. 1. Grant and Meade-Burnside, the commander of the IX corps making the assault, had trained a division of United States Colored Troops to lead the advance after the explosion of the mine. The day before the battle Meade, concerned that the attack would fail and that their would be political repercussions if black troops incurred heavy casualties as a result, ordered Burnside to assign a white division to lead the attack. Burnside protested this decision, but Grant backed Meade up. 2. Burnside-Burnside had the white division chosen by lot rather than picking the best division. Burnside made no effort to make certain that his attacking divisions had access ways cleared of debris and fortifications so they could rapidly advance after the explosion. He made no effort to inform the new white division leading the assault that it was to go around any crater created by the explosion instead of going down into it, which is precisely what the attacking divisions did, making themselves sitting ducks at the bottom of a large hole when the Confederate counter-attack began. Rather than calling off the attack after it became obvious that no breakthrough was possible, Burnside kept feeding troops into the Crater with the only effect being to lengthen the list of Union dead and wounded. 3. James H. Ledlie-Brigadier General James H. Ledlie earned a notable distiction during the battle. It was not unusual for Civil War generals to make bad decisions, and to not infrequently show a distinct lack of common sense, however almost all of them were very brave men. Ledlie was not. In addition to being a very bad commander as indicated by his failure to inform his division of what was expected of them after his division was chosen by lot to lead the assault, he spent the battle drunk and well behind the lines, safe and secure as his men went into the meat grinder. He richly earned his dismissal from the Army after the battle. 4. Edward Ferrero-Brigadier General Edward Ferrero was the foremost dance instructor in the country prior to the War. He should have stuck to that trade. The commander of the black division involved in the battle of the Crater, he spent the battle in the same bomb proof dugout behind the line as Ledlie, and he shared Ledlie’s bottle with him. Ferrero’s behavior is somwhat incomprehensible as he had shown extreme valor in other battles. Astonishingly he was not cashiered from the service, and in December of 1864 he received a brevet promotion to Major General of Volunteers for “bravery and meritorious services”. With this type of leadership it is no wonder that the attack failed. The initial mine explosion killed 278 Confederates and wounded hundreds of others. For 15 minutes the stunned Confederates did not fire at the attacking Union units. Union troops went down into the Crater and within an hour were receiving heavy fire from Confederate troops at the top of the side of the Crater facing Petersburg. Confederate Brigadier General William Mahone, in charge of the Confederate counterattack, called it a turkey shoot. 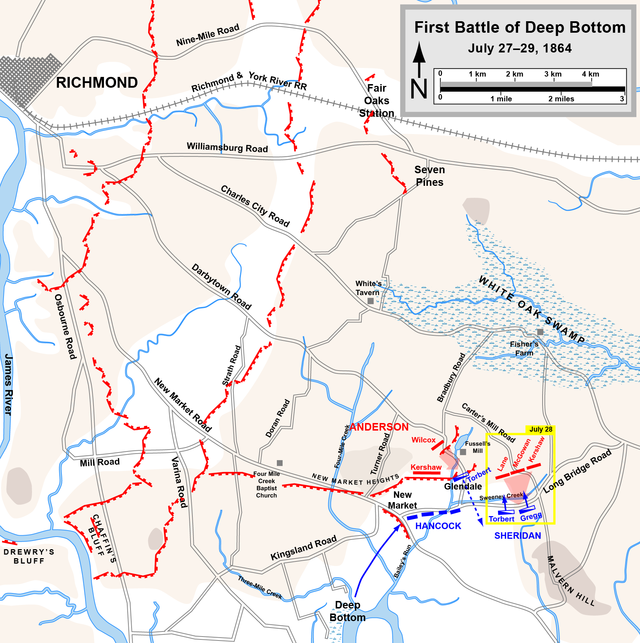 Instead of calling off the attack when it became clear that the Confederates had sealed the breach caused by the explosion, Burnside kept sending divisions, including the black division, down into the Crater where they were quickly slaughtered. Some Confederate troops murdered black troops who were trying to surrender. When General Lee heard of this he supposedly sent a message to General Mahone telling him to put a stop to this or he would be removed from command. Union casualties were 4000 to 1500 for the Confederates. The whole debacle was the subject of a lengthy investigation by the Congressional Joint Committee on the Conduct of the War. By far the most unusual event during the siege of Petersburg was the attempt by Grant to take Petersburg by a huge mining operation. 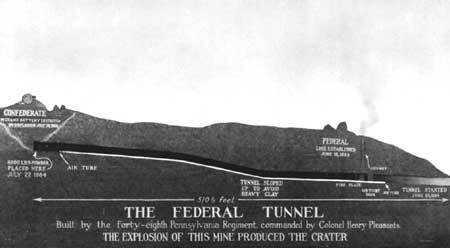 The idea of the tunnel was devised by Lieutenant Colonel Henry Pleasants, the 33 year old commanding officer of the 48th Pennsylvania. Pleasants was a mining engineer in civilian life and many of his men were coal miners. He became convinced that his men could dig a tunnel under the Confederate fort known as Elliot’s Salient, then fill a mine under the fort sufficient to blow it to kingdom come, along with nearby Confederate trenches. Pleasants took the idea to his corps commander Major General Ambrose Burnside. He and his men had received permission, but he received virtually no assistance from the rest of the Army in the digging of the tunnel, he and his men having to improvise everything they used. Engineering officers told Pleasants that he was crazy and at 511 feet the tunnel would be too long and his men would die of asphyxiation digging the tunnel long before it could be completed. The tunnel was elevated as it advanced toward the Confederate fort to prevent moisture clogging it up. Fresh air was pumped in by air-exchange mechanism near the entrance. Pleasants had constructed a ventilation shaft located well behind Union lines, and connected it to the mine with canvas. At the shaft’s base, a fire was kept continuously burning. A wooden duct ran the entire length of the tunnel which protruded into the outside air. The fire heated stale air inside of the tunnel, forcing it up the ventilation shaft and out of the mine. The resulting vacuum then sucked fresh air in from the mine entrance via the wooden duct which transported the fresh air to the digging miners. The took took a bit over two weeks to dig and the mine fifty feet under the Confederate fort took almost another two weeks to construct. It was filled with four tons of gunpowder. The Confederates attempted some desultory countermining operations, but the Union tunnel troops went about their work undiscovered. By July 28, 1864 the mine was ready to explode whenever the high command gave the word. That word would be given on July 30, 1864. When I was down in Springfield last week, go here to read about my family’s annual pilgrimage to the Lincoln sites this year, I purchased several books at The Prairie Archives. That bookstore is a treasure trove for those interested in the Civil War and/or Lincoln. Two of the books were written by James G. Randall, the first volume of his four volume study of Lincoln as President and his Constitutional Problems under Lincoln. Randall, who died in 1953, was a history professor at my alma mater, the University of Illinois, for three decades. The foremost Lincoln scholar of his day, his body of work on Lincoln demonstrates how historians are influenced by the contemporary history they live through, and how the march of history after they are dead can make their interpretations obsolete, at least until history shifts again. The formative event in Randall’s life was World War I. He viewed the immense carnage as a huge waste, a war fought over issues that were unimportant compared to the huge loss of life involved. World War II confirmed his belief in the futility of war, as he interpreted that conflict as being brought on by fanatics, this time Fascists, who caused millions of deaths in a completely unnecessary conflict. In regard to the Civil War, Randall saw it too as an unneccessary conflict brought on by fanatics, fire eating secessionists in the South and, especially, abolitionists in the North. Randall viewed the abolitionists as earning most of the blame for bringing on the War, turning political differences over slavery to be settled by compromise, into a crusade that could only be resolved by rivers of blood. Randall summed up his argument in a paper entitled The Blundering Generation delivered to the Mississippi Valley Historical Society on May 2, 1940 at a conference in Omaha, Nebraska. Randall’s thesis was that the War largely came about over a controversy over slavery that was merely a phantom. There was never a question that the Western territories were going to be free territories due to the greater numbers heading for the West from the North, and the unwillingness of slave holders in the South to risk their slaves in the West on land not suitable for large scale plantation crops such as cotton and where they would be without the legal protections afforded by slave states to slaves as a species of property. Unbeknownst to the Confederates, on July 27, 1864 the Union forces around Petersburg were putting the finishing touches on a huge mine under a fort in the Confederate defenses known as Elliot’s Salient. 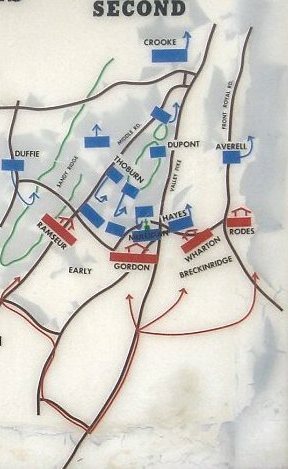 To divert Confederate attention from this sector of the line, Grant ordered Hancock and Sheridan to cross the James River at Deep Bottom and make a lunge towards Richmond. Grant assumed this would cause a weakening in the Confederate defenses around Petersburg and he was correct in that assumption. Lee in response to Grant’s move pulled some 16,500 men out of the Petersburg lines and into the Richmond fortifications. 1. Weather: Illinois has been experiencing one of the coolest Julys on record. Yesterday the high was 80 degrees Fahrenheit, which is about 15 degrees below what we often experience at this time of year. Very pleasant weather for walking about downtown Springfield. 2. 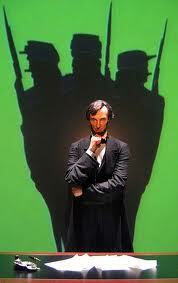 Officiousness-My family and I renewed our membership in the Lincoln Museum Association for $70.00. That is pricier than if we had to pay for tickets but I like to encourage the Museum with funds, especially as I view the enjoyment of the kids who come there to see the Lincoln exhibits. Right after we did that a guard stopped us as we were entering the main part of the museum and asked to examine my wife’s purse. He saw that she had gum and mints and told us she would have to put the gum and mints in a locker before we could enter since no food and drink could be brought in. We have been coming to the museum since 2006, after it opened in 2005, and this had never happened to us before. It was obvious to me that the young man was taking a reasonable rule and making it absurd. We complied, although the lawyer part of me wanted to make an issue of it. However, I did not want to get the young guard into trouble, which I assume will happen swiftly enough if this is how he is treating all female patrons. I decided to let it be by someone else’s hand and I was not going to mar our day with a confrontation. 3. Decisions-The museum was wonderful as always. The standout for me, as usual, was Lincoln standing behind his desk, looking at the draft of the Emancipation Proclamation, as shadows behind him gave him conflicting advice about whether to emancipate the slaves. Great decisions are always easy unless you are the one making them. 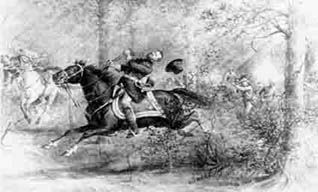 After the ending of his raid on Washington, General Jubal Early returned to the Shenandoah Valley. With Early no longer a threat to Washington, the Union VI and XIX corps were returned to Grant’s army besieging Petersburg. This left only the three division Army of West Virginia under Major General George Crook to contest the Shenandoah with Early. Crook planned to attack Early at Kernstown on July 24. Crook began getting messages from his division commanders indicating a reluctance to attack Early as the Confederates seemed to have a numerical superiority. Their caution was justified in that Early had about 13,000 troops to the Union 10,000. 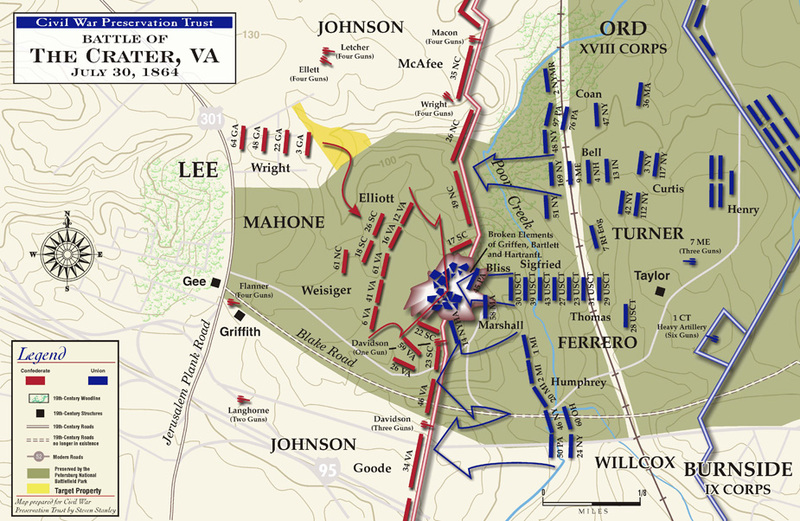 A Union attack began at 1:00 PM and was quickly routed by Major General John Breckinridge. This began a panic in the Union force that routed as the Confederates chased them back into West Virginia. Union casualties were 1200 to 600 Confederate. With this victory, Early once again raided the north, burning Chambersburg, Pennsylvania on July 30, and go here to read about it. 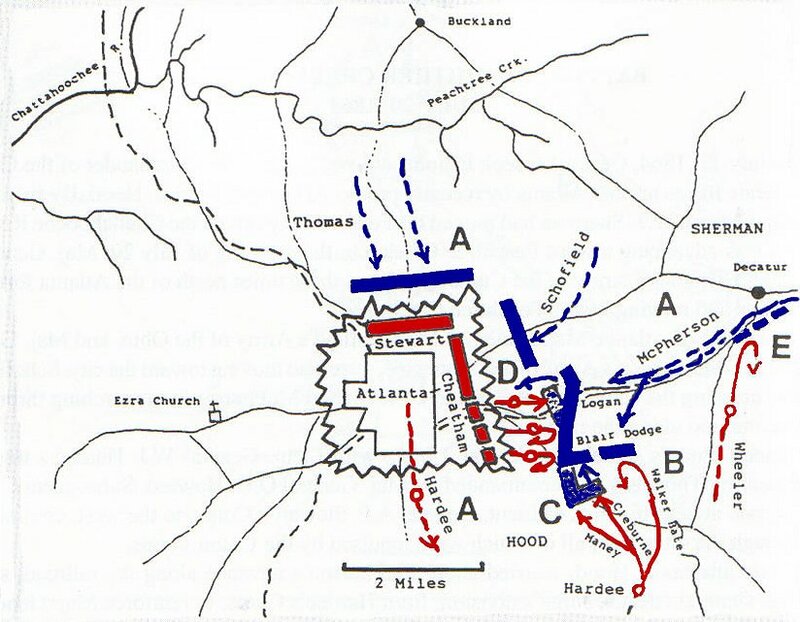 Grant now realized that Early was a serious threat, and turned the VI and XIX corps back around towards the Shenandoah. He placed Major General Philip Sheridan in overall command with the mission to stamp out Confederate resistance in the Shenandoah for good. I hardly feel that I should apologize for intrusion, for I can claim an old acquaintance with your Brother and Sister in California, and feel almost that I know you through them, and others of your honored family. It has come to my knowledge that you are affianced to another close friend and associate of mine Maj General McPherson, and I fear that weighing mighty matters of State but lightly in the Realm of Love, you feel that he gives too much of his time to his Country and too little to you. His rise in his profession has been rapid, steady and well earned. Not a link unbroken. Not a thing omitted. Each step in his progress however has imposed on him fresh duties that as a man and a soldier, and still more as a Patriot, he could not avoid. I did hope as he returned from Meridian, when his Corps the 17th was entitled to go home on furlough, that he too could steal a month to obey the promptings of his heart, to hasten to Baltimore and I so instructed, but by the changes incident to General Grant’s elevation, McPherson succeeded to the Command of a separate Army and Department, and could not leave. There is no rest for us in this war till you and all can look about you and feel there is Reason and Safety in the Land. God purifies the atmosphere with tempests and storms which fall alike upon the just and unjust, and in like manner he appeases the jarring elements of political discord by wars and famine. Heretofore as a nation we have escaped his wrath, but now with the vehemence of anhundred years accumulation we are in the storm, and would you have us shrink? But I will not discuss so plain a point with one who bears the honored name of Hoffman, rather tell you of him whose every action I know fills your waking and sleeping thoughts, him so young but so prominent, whose cause is among the gallant and brave, who fight not for oppression and wrong but that the Government bequeathed to us by your ancestors shall not perish in ignominy and insult: but which shall survive in honor and glory, with a power to protect the weak and shelter the helpless from the terrible disasters of a fratricidal war. I know McPherson well, as a young man, handsome and noble soldier, activated by motives as pure as those of Washington, and I know that in making my testimony to his high and noble character, I will not offend the Girl he loves. Be patient and I know that when the happy day comes for him to stand by your side as one Being identical in heart and human existence you will regard him with a high respect and honor that will convert simple love into something sublime and beautiful. Her father was a rich Baltimore merchant, strongly pro-Confederate in his sympathies, as was his mother who organized sewing bees to produce garments for Confederate soldiers. A son was fighting in the Army of Northern Virginia. The Hoffman family strongly disapproved of Emily’s engagement with a Union general.